Unser Ferienhaus befindet sich am Ende einer Sackgasse auf einem 1 Hektar großen Paradies mit wunderschön gestalteten Gärten in Montecito. Das 700 Quadratmeter große Cottage liegt knapp 1,6 km vom Meer entfernt und verfügt über ein schönes Wohnzimmer mit einem Gas- / Holzkamin, eine geräumige, voll ausgestattete Küche, ein gemütliches Schlafzimmer und ein Vollbad. 2 französische Türen im Wohnzimmer öffnen sich zu einer großen überdachten Terrasse mit Blick auf den Hinterhof. Auf der überdachten Terrasse finden Sie eine entspannende Hängematte, einen kleinen Tisch mit Stühlen und einen Grill. Einfacher Zugang zu Einkaufsmöglichkeiten, Restaurants, dem Strand und Wanderwegen machen dies zum perfekten halb-ländlichen Kurzurlaub. Das Haus verfügt über alle modernen Annehmlichkeiten wie eine voll ausgestattete Küche, Flachbild-TV, DVD, Wi-Fi, Terrasse. Badezimmer hat eine schöne Keramikspüle von der Puerta Vallarta, sowie handgefertigten mexikanischen Fliesen in der Dusche und Eitelkeit. "My husband and I spent 3 nights at this beautiful house. It is very clean, well maintained, tasteful and cozy furnishings. The beautiful large kitchen leaves nothing to be desired. The terrace looks out over the beautiful garden. The neighborhood is quiet and safe. The owners Vicky and Gary are very welcoming hosts, they live in the main house on the same grounds. We felt very comfortable and enjoyed the hospitality of our landlord. We can only recommend the house, it is also very good and suitable for a longer stay." Clean quiet and looks like the photos. The owners were helpful and great hosts. A wonderful little cottage in Montecito amidst Eucalyptus and fuschia bougainvilla on a little hill provided a peaceful week for us. Our hosts were most welcoming and warm. The cottage was in an ideal location to both upper and lower villages as well as just a few minutes to Carpinteria and Santa Barbara. The furnishings were most comfortable and tasteful. We highly recommend Hedgerow! Very comfortable. Great location. Vicky and Gary are awesome hosts. We will be back! My husband and I loved the cottage! It’s very peaceful and private, and convenient to both the upper village (15-minute walk) and lower village (5-minute drive) in Montecito. Santa Barbara proper is a short distance, as are all the beaches. During our week’s stay, we visited family in Santa Barbara, went to several beaches, ate out around State Street and the Funk Zone, and explored other tourist sites in the area. At the end of the day/evening, it was wonderful to return to the cottage for a quiet night’s sleep and undisturbed morning, away from the crowds. The cottage is so comfortable with many windows, French doors, and shade. As evident from the website photos, the design details are lovely. The owners are welcoming and very helpful, but unobtrusive. We look forward to a return visit and highly recommend the cottage. 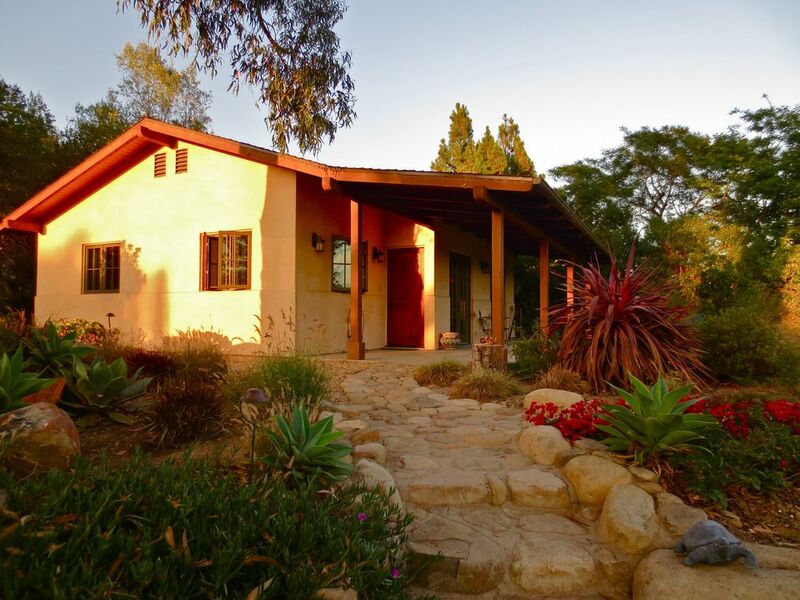 Not far from the hustle and bustle of Santa Barbara sits a beautiful little cottage. This wonderfully crafted one bedroom building has all you need for a weekend away. Slept with all fo the windows open each night and woke to sounds of birds. The owners are extremely friendly and helpful. Das Hotel liegt im schönen Montecito sind Sie nur wenige Minuten von Sehenswürdigkeiten, Strände oder Bergwanderungen. Innerhalb einer Meile von der Hütte Sie eine Vielzahl von feinen Restaurants und High-End-Shopping finden. In der Nähe von Santa Barbara verfügt über weitere spannende Besucherzielen, Einkaufsmöglichkeiten, gemütlichen Wandern oder Wanderwege und Restaurants. Unsere Kai und am Wasser bieten einen schönen Panoramablick auf die Stadt. Sie haben auch einfachen Zugang zu den Santa Ynez Weingüter. Wir sind 90 Meilen von Los Angeles, 145 Meilen von Hearst Castle und 300 Meilen von der Bay Area. Holidays are $260 per night. This includes Winter and Spring break. 3 night minimum on major holidays. There is no tax on stays over 30 days. There is a cleaning fee of $75 for stays of 2-3 days, and $100 for stays of 4+ days. Long term stays may have additional discounts, and/or additional cleaning fees. Please call or email for a quote.